My dad recently passed away and I found one of your semi acoustics among his guitars. Could you tell me approximately how much he paid for it so i can set a reasonable resale amount. I am actually shocked to see you don’t make guitars anymore! I used to get my parents to buy my guitars from you when I was younger and I have just been able to buy a new one and I thought of Wesley straight away! I just want you to know that you influenced my passion for music greatly and I love the Wesley guitars I have more than anything! Likewise! There’s a quite a collection of guitars of all types in this house, and the Wesley outplays them all. I bought a Cougar 2 Bass guitar which is absolutely amazing for the money. I was so impressed I have just bought a Wesley Vermont 6 string on e-bay. If it is anything like the bass it will be incredible. I just found out you no longer make bass’s and am gutted! Why why why? I have tons of bass guitars and the Wesley is 1 of my faves! Our kid owns 2 Wes guitars too and they sound great! Will you ever make them again? John, thanks for the recent work on my guitars and mandolin. I would recommend your workmanship to anyone. First class service all round and very easy to get on with, much appreciated. Apologies if you get this message twice… I’m unsure if the previous one posted. I need a replacement machine head. Can you advise me on where I can find a replacement please? 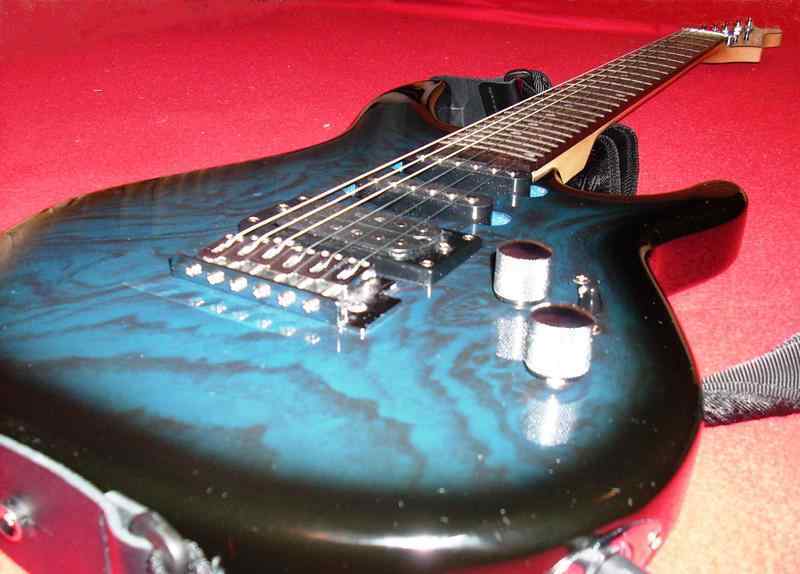 had a blue quilted top sorta “prs” shaped wesley guitar pre-2005 remember it feeling a bit heavy but it was an absolutely amazing guitar, unfortunately it got stolen but im always on the look out for a second hand one, it outperformed everything in its price range by miles and i miss playing on it! was shocked to find they are no longer being made but hopefully ill be able to find one soon! Such a pity that you are no longer making guitars. I bought a beautiful 7-string electric in 2003 from you. It has a quilted yellow body with gold fittings and a rosewood (?) neck. It is by far my favourite instrument, and superb to play. Although I rarely gig now, it is the one that my nephews always go for when they visit despite the choice of Fender, Tanglewood, Jim Deacon, Aria and Rogers instruments. Yes I remember that model. It was manufactured in Korea and there were only 12pcs made. I may start producing Wesleys again in the near future. Very nice to hear from you Rob! Intrigued to hear you might start selling guitars again. Why not ask for people’s ideas as to design preferences? Whatever you decide though…good luck. Brilliant guitars still in use and circulation Mr.Wesley. My first electric was a Les Paul type in silver sunburst and I honestly haven’t found a guitar that is as flawless and rewarding to play even in much higher price ranges. I have a blue wesley telecaster with a seymour duncan at the bridge if you wanna buy it? My partner recently picked up one of your guitars from a charity shop for the bargain price of £50. I’ve had a look online and can’t seem to find any like it, all I’ve managed to work out is that it is pre 2005. I stumbled across your website and as the guitar has a fair amount of damage to the paintwork I was wondering if I could send pictures of the damage would you be able to give a rough estimate for what it would cost to repair the damage. Bought an acoustic jumbo and in a moment of madness and generosity gave it to my son ( regretting it ever since). Thankfully he never plays it so after a five years he has agreed to give it back. I am ecstatic: a great favourite of mine despite having a Gibson J200, a Rainsong, and a few other top end guitars. I also bought a lovely mandolin from Wesley. The instruments were excellent and it is a great loss to musicians that Wesley instruments are no longer on sale. Hello. I just saw some pictures of the fantastic bass that you made… the flying v in black.. I found a mad- looking purple Perspex Wesley bass in a charity shop for £60!! Although I don’t regularly play bass, I had to have it. Since then its done a couple of gigs and I love it! Good to know it was made in England and I can still contact the builder. just managed to find a see through purple wesley strat (never been played, hanging on a friends wall, baught it cos it looked nice) for £100 in mint condition. been eyeing it for years. she finally told me she was selling it and i said ok starght away no questions. i love the guitar. heavy but sound amazing. Hi Gary, that’s great to hear. There were only 48 of these violin bass models made in 2002. Where was built this lot of violin bass guitars? These were built in Korea by the Saein factory who I believe used to make Epiphone LPs for Gibson a while back. I had a 60s Hofner in earlier in the year and the Saein model knocks socks off the Hofner. Sorry, I sent a wrong link. This is the right one. Hi there, this was a budget model we did about 7 years ago. It was part of a package. I was never happy with the quality of these models and discontinued them quickly. Having said that with a deluxe set-up it could be made pleasurable to play. Thank you so much! Can you tell me where it was made? Hello, this one was made in China, earlier models were Korean and of higher quality. Mr wesley. You have been solely responsible for my addiction.. I have two acrylic strats. One acrilic lp. One blue tele. One flying v and one warlock. On the tele I replaced the bridge pup to a steamhammer. On the v I put in a seymour. On the warlock I put inf pups in it. In the strats I put hotrails. The point us this. While the stock pups are fine. By replacing them these guitars are my main gigging guitars now. Relegating the epi.s and even a gibson explorer into collecting dust.. wouldn’t swap any of them. The acrylics especially turn heads at gigs.. thank you so much and keep up the good work.. I have a hollow body single cut jazz guitar, I pick up from eBay, it had a broken machine head and a couple of chips the worse one on the back of the neck (which is still there) I fitted a new set of gotoh tuners restrung it with elixir 10’s (acoustic) and I love it. I change my guitars around quite a lot just to keep it interesting, but I would never sell this one, I did the set up and fret level/dress my self and must admit I did a good job, it plays fantastic and certainly much better than the ibanez’s (art core’s) I had/tried or the peavey. Very pleased but I don’t know anything else about it. If you have any info I would appreciate it. I have a pink precision style bass , an acrylic les Paul (retrofitted with blue leds) a five string clear acrylic bass and a Gibson style double cutaway hollow bodied electric … I still buy more if you were making them !! I have finally found one of the blue, 22 fret Telecaster models and was wondering if anyone could provide some basic info on it e.g. body and neck/fretboard woods and what pickups were originally fitted. I bought an acrylic yellow 5-string wesley bass guiatar off eBay a while back (it has the pre 2005 logo on the headstock) and i was just wondering what its proper name is and how much it would be to buy? And also ive tried looking for it on the internet but i cant find any so is this the only one? Hi Michael, can’t see the link there. Hello I’m a blues guitarist from Kansas City and I recently discovered your jasper acrylic travel guitars. I was curious if you happen to still be making them or if you have any for sale. Just bought my second Wesley – a Tartarus V if the limited net info is correct. Needs some work doing, but that just adds to the fun…has the pre 2005 logo, very heavy and beautiful rhoads shape. Any info on this model mr. Wesley? Country, body wood, pick up type? Also had a Dominator (explorer shaped model), sounded great and played beautifully…had to sell it as needed the money but regretted it instantly. Again, heavy and well made, a pleasure to play. We mailed recently about your seven string telecasters, sadly no longer in production… anyway I bought the one off ebay that I think you mentioned having seen as well. I bought a Wesley Jaguar on EBay, cleaned it up, set it up, put in a hot rail, I love it!! Hey john . I have a clear jasper and use for buskin. Is a great instrument. High quality and affordable. Thank you . I will keep it with me always. The tonal attributes of a strat. Anyway I just wanted to say well done on creating something unique, my brother receives it tomorrow. Cheers!